I am writing to you today--both those I know and those I don't know--to let you know something. I'm so sorry. I'm sorry for everyone of you who have been the victim of Christians everywhere. 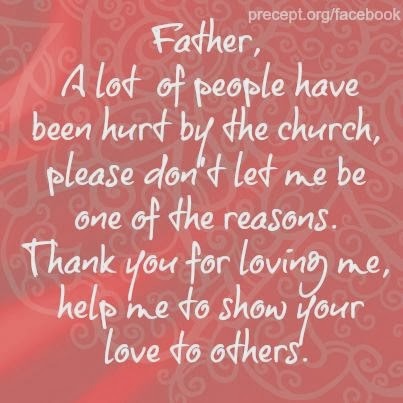 Who have been hurt by the church. Who have been on the receiving end of judgment, exclusion, criticism, hatred, and cutting words. Whether you are also a Christian or not. We, the Church, have long struggled with a tendency to hold our weapons firmly and fire away with little thought to the wounds we inflict. Not to mention how we so completely misrepresent the Christ we claim to follow. For too long, I'm afraid, since the time of the crusades, we have acted on more of our own human tendencies, perhaps out of fear, and hidden it in some package claiming to act in the name of Christ. In so doing, we have painted a picture of an inclusive, mean spirited, judgmental angry God. We have allowed our misrepresentation with a holy zeal. Perhaps even quoting Scripture as our shield and excuse. We have taken the charge of political agendas and mixed them in with our theology and created a byproduct of who we say Christ is, yet forgetting the individuals who are wounded in the process. Who we are--the self-righteous and holy few. And who you are--the undeserving, imperfect, hated and judged many. We've allowed a plague of "us" and "them" to run rampant like an epidemic. And we've allowed our churches--no, I think we've built and created our churches--to become a showcase for the shiny, perfect Christian with no error or flaw rather than a safe haven and hospital for the broken and confused and lost and desperate. I need you to know something. The older I get and more that I learn and allow myself to be dealt with by the God I serve, the more desperate I become to let you know something. Whether you are gay or straight, black or white, familiar with Scripture or not--Jesus loves you. I need you to know who Jesus is. Because if you feel like a good person who has had a bad Christian happen to you, then you have not yet met Jesus Christ at all. Jesus is inclusive. You see, God so loved THE WORLD that He gave His only begotten Son. No exceptions. The world--that's pretty inclusive. When Jesus walked the earth, He did not shut himself up in the synagogue with the pretty plastic followers. In fact, He had a lot to say about the religious and pious who set themselves apart. He called them white washed tombs. Pretty on the outside. Dying on the inside. He was radical. And it scared the Pharisees and the Saducees. Because He was so radical to have dinner with tax collectors and prostitutes. He went to the Samartians and even the second class citizens that were women and children and He told them come to me. He said the kingdom belonged to them--to those who seek Him and love Him and are desperately hungry and thirsty for more than this world had given them. Jesus was scandalous in his love for the marginalized, oppressed, poor and outcast of society. Jesus was love. He did not go around spouting judgment in one-on-one interactions. He boldly proclaimed truth--yes. But, He always, always poured out love and grace. Judgment was not His message. No, His message was a love that was so big that He loved every single one of us in the history of all mankind to death. Even death on a cross. You were on His mind when he left the Throne Room of heaven and surrendered himself to confine His diety in the flesh of mankind. As a baby. You were on His mind when he was misunderstood and confronted by the religious zealots of His day. You were on His mind when He was sitting with his disciples at that Last Supper and He said, "This is my body broken for YOU. This is my blood, spilled out for YOU." You were on His mind when He prayed to His father to let the inevitable pass by Him--yet not His own will, but God's. You were on His mind when minutes later, He was taken into custody to be beaten and broken and bruised. You were on His mind when He carried that heavy wooden cross through the streets, being spat upon and misunderstood and hated. You were on His mind when His feet and hands were nailed to the cross. You were on His mind as He cried out to His father about being forsaken. And you were on His mind when He declared, "It is finished!" And then He gave up His spirit. You were on His mind on that glorious first Easter morning when he stepped out of a grave to boldly proclaim that all sin, all death, all wrongs had been righted through the covering flood of His blood. My Jesus said that all have sinned and fallen short of the glory of God. All. From the self-righteous perhaps well meaning yet wounding Christians who might misrepresent Him as anything but a God who loved to death. To the worst of sinners in prison or elsewhere. All have sinned. All fall short. And Jesus died for all. For every single one of us. And if His love and His grace is enough for me, let me assure you. It is enough for you. So, please, I beg of you, listen in. If you have ever been wounded by a Christian--if you've been a victim of a misguided faith--please take a second look at our Savior. Oh, he'll call out His truth and commands and direct you to sit in His company and learn how to know Him more, to follow Him more, to surrender to Him more. But, He is all about love. His message is hope and love and grace for all. No matter what. No exceptions. He didn't ask that we get it all right and perfect and good and then see if we are good enough for Him. He said because you aren't good enough on your own, He's made a way. So come. Come to Him. Unhindered. Unashamed. Come to Him. Taste and see that the Lord is good. Sit at His feet and let His love pour out. And follow where He leads. Because the gospel is the good news for all. And my Jesus died for all. And that means every single one of us. Please, please know how sorry I am. Because I want us all to know the freedom that Christ came to offer. Freedom from judgment. For both the one who judges. And the one who is judged. Freedom to be forgiven for all, taught how to surrender, and to be loved by Him for eternity.